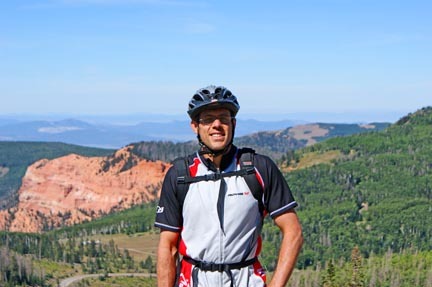 Three of us, plus four bikes, made a road trip from Santa Barbara, California up to Brian Head, Utah for the NMBS (National Mountain Bike Series) mountain bike races. I did ride on this trip, but I didn’t want to race; instead, I spent most of my time taking pictures of the riders on the mountain. In all, I ended up taking more than 1,000 photos. I shot most of them during the practice runs the guys were taking down the pro course. This was an interesting course, because there were 2 choices for the line you could take down. 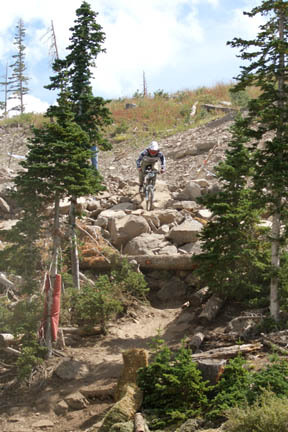 There was a “hard” line which took the riders down over a bunch of rocks plus an insane drop. My photos really don’t do this spot justice at all~ they fail to convey how big the drop was. My opinion: You’d have to be a NUT CASE to ride a bike down that! And then there was the “easy” way down, which was not easy, either, by any stretch of the imagination. 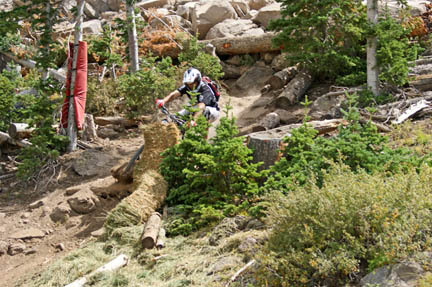 I overheard more than one rider saying that the hard way was actually easier than the easy way, all things considered. 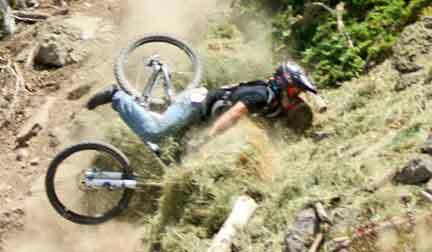 On the other hand, all the crashes I witnessed ~ and there were quite a few of them ~ Took place on the harder spot. 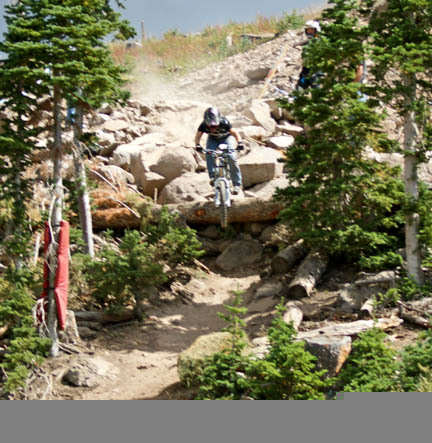 Here we have some photos of Brad Jensen, an Oneal / Azonic sponsored rider who raced the men’s expert-master 45-49 class. Until right about here, when all of a sudden I’m thinking that something looks amiss. AAAAAACKKKKK. Who put that hay bale there? Double ouch. 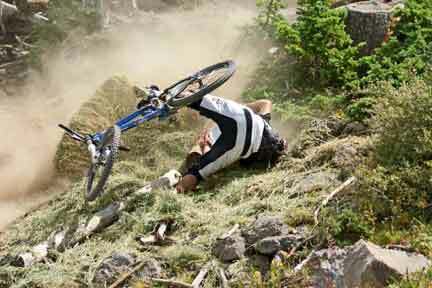 Nothing like getting whacked by your own bike. Right about now, I have to ask, where’s the rest of your padding, Brad? Are you nuts? 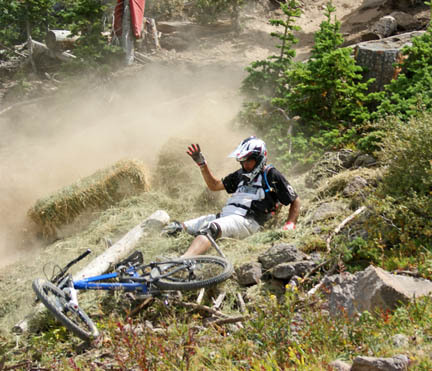 Dude, if you’re going to ride down insane terrain like this, get some elbow pads. Seriously. A longer pair of protective Shin guards wouldn’t be a bad idea, either. We’re SO RELIEVED to see you got right back up! Major props. That looked like quite a spill. Hope you didn’t suffer any lasting injuries after that one. 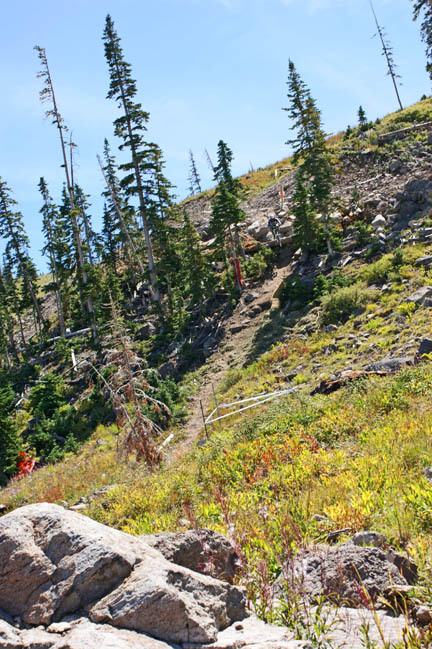 Did I mention, you’d have to be a complete maniac to even attempt this trail? Not kidding. My photos do not do it justice. It’s impossible to get a sense of just how big and insane this part is unless you actually stood at the top, looking down. OK, so he launched off of it… Not bad, so far. Looking good…Will he land this? Looks like he’s clearing that sketchy spot here. YES! Rock on! Wait a minute…wait a minute…UH-Oh. 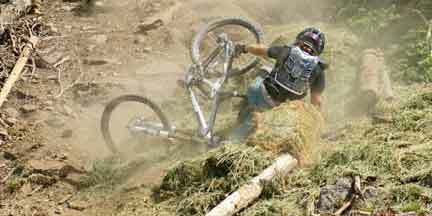 Here’s something you don’t see every day ~ an expert mountain biker face-planting right into a bale of hay. WhoooHOOOOO!!!! Super stoked to see him get up after that. 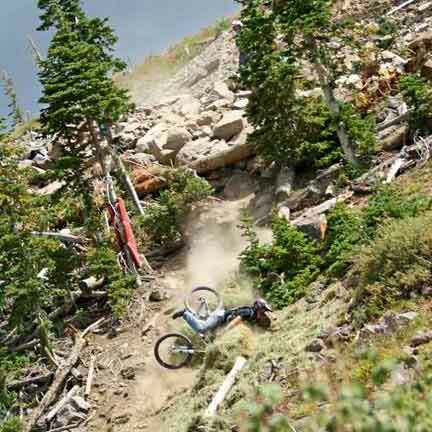 Great crash, dude. Hope you are not too banged up, bruised up or scraped up after that! 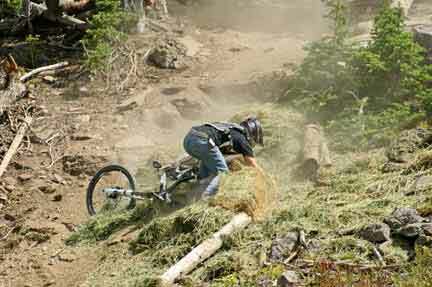 Chris W. was planning on racing the downhill course. 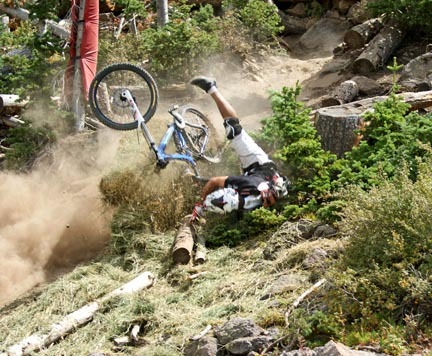 Mike wasn’t planning on racing, or maybe just racing the Super D. But in the end that’s not how things worked out. 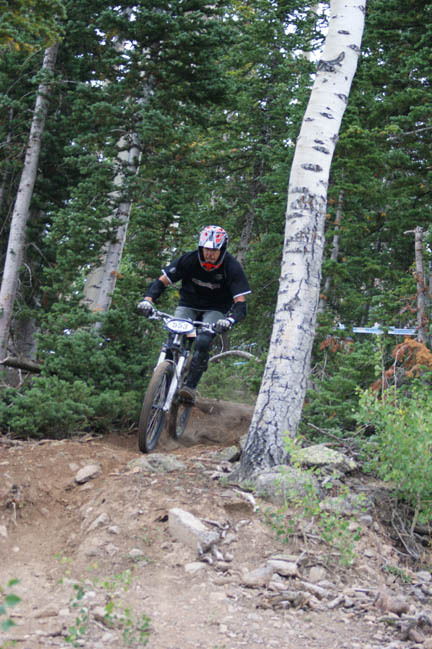 Mike didn’t bring a downhill bike, so he wasn’t sure if he would be able to race the downhill course. 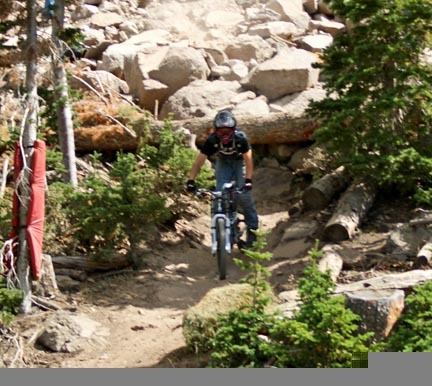 Then when he actually saw the downhill courses, he thought the sport class downhill trail looked easily do-able on his bike, so he decided to go for it. 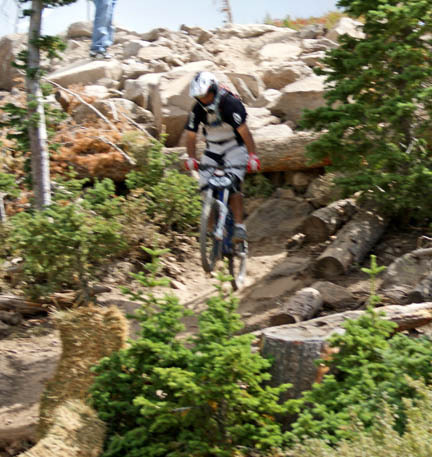 And he definitely wanted to race the Super D too after seeing how much fun that trail was. 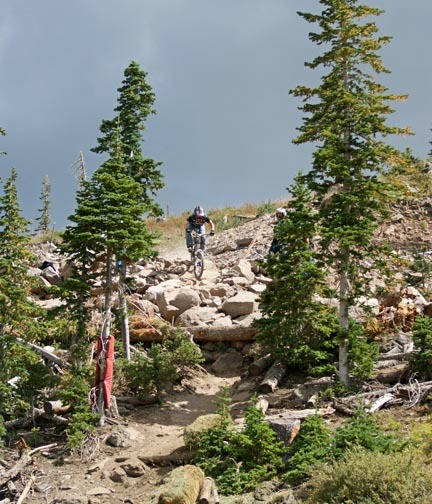 In the end, the Super D got rained out and rescheduled to a time that conflicted with his downhill race, so he just ended up racing the downhill. And got a flat. Bummer! His time wasn’t bad, considering the flat. And he did walk away with a medal. Did he listen to me? NO. 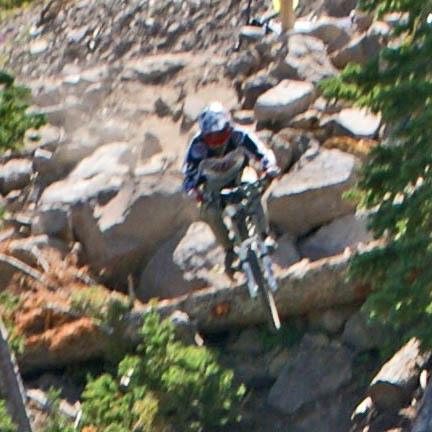 🙁 So I don’t have any photos of his crash, although I do have plenty of pics of him where he made it down the mountain just fine. He made it look easy. 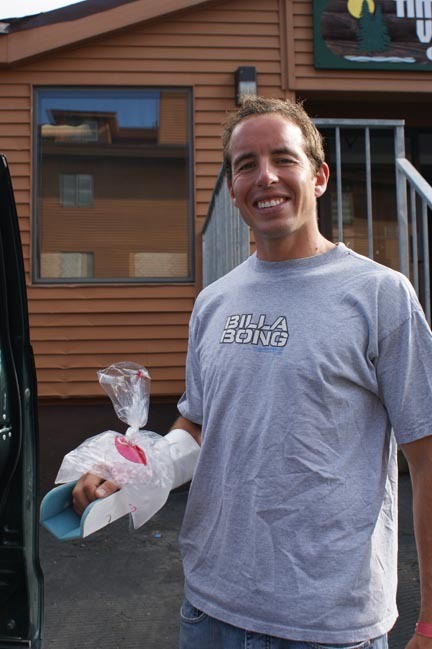 That’s my friend Chris for you…he was nuts enough to ride a bike down that, and he has the cast to prove it. 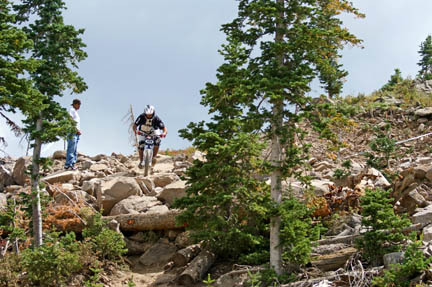 This entry was posted in Mountain Biking, Travel, Utah and tagged Downhill Mountain Biking, Mountain Bike Racing, Outdoor Sports on September 3, 2008 by Amy.